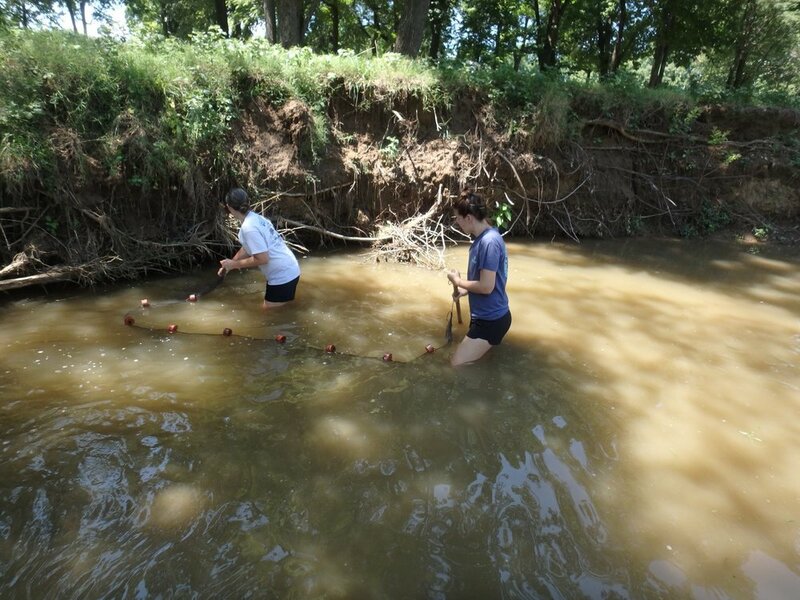 Howe High School Science Teacher and Oklahoma Blue Thumb Volunteer, Mrs. Leigh Cooper participated in an all-day Fish Collection on Morris Creek on Thursday, August 2, 2018. 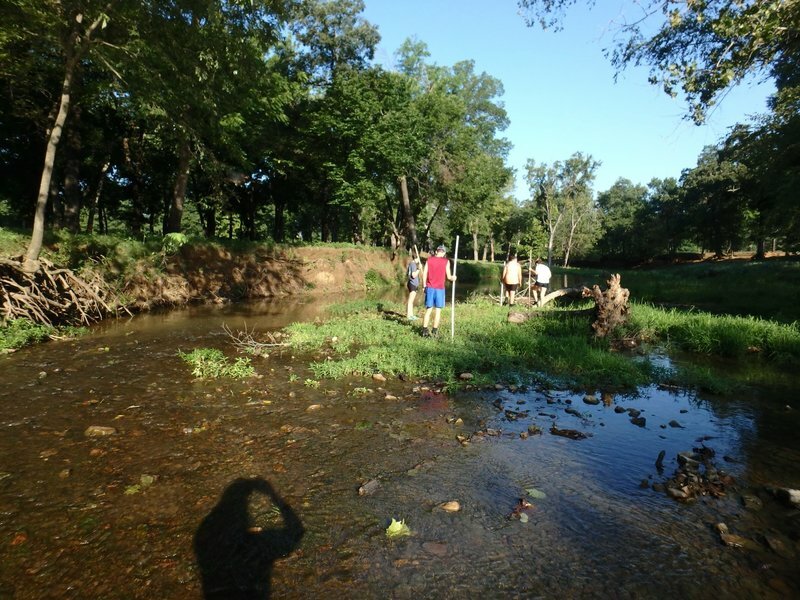 Mrs. Cooper volunteers monthly to monitor Morris Creek in Howe, OK (LeFlore County). During the school year, she coordinates monitoring activities with the High School and Middle School Science Clubs. As an Oklahoma Blue Thumb Volunteer, Mrs. Cooper is responsible for monthly biological, physical and chemical monitoring of Morris Creek. 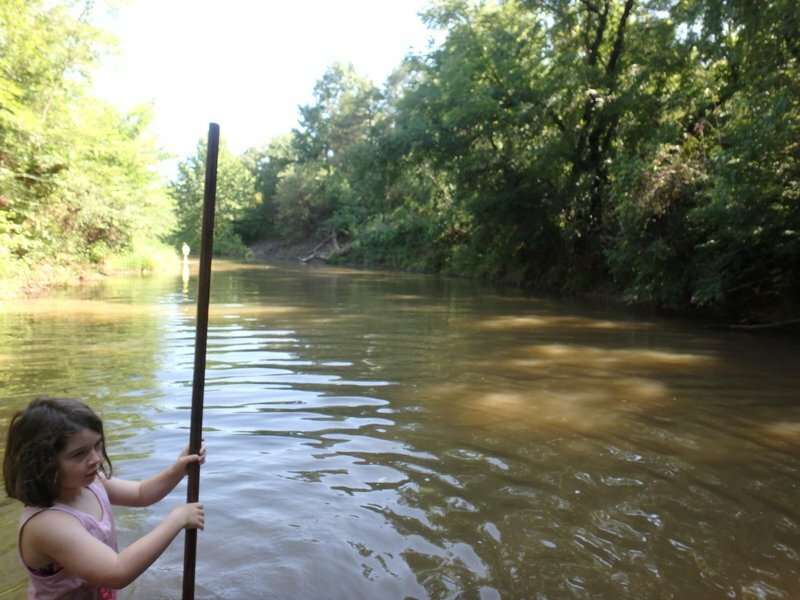 According to the Oklahoma Blue Thumb website, "across the state of Oklahoma over 300 volunteers actively monitor 100 streams in an effort to help protect these water bodies. Volunteer data is used to gain valuable information about the state's streams. " 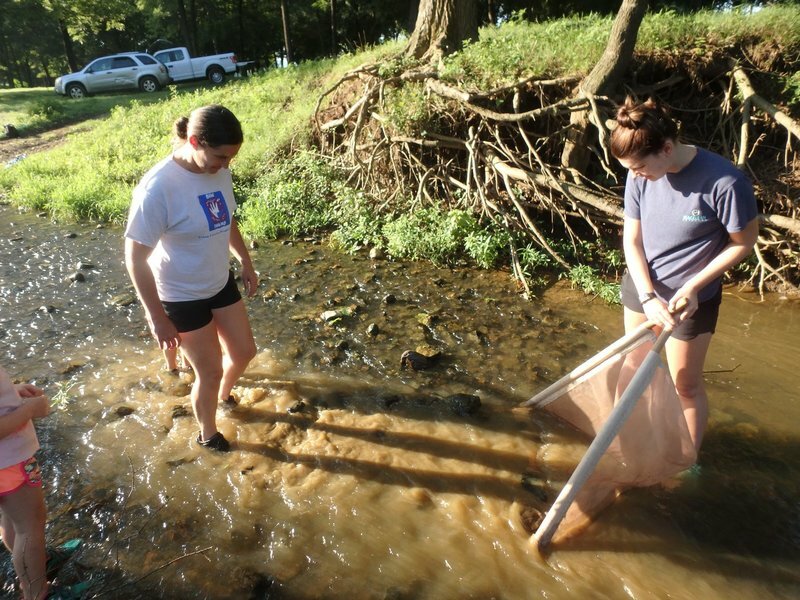 During the recent biological monitoring of Morris Creek, which included the fish collection, Mrs. Cooper and Howe's new High School Science teacher, Jessica Wigginton collected over fifteen species of fish. Oklahoma Blue Thumb published a post on their Facebook page about the visit to Morris Creek. Here's what they shared, "Our most recent fish collection was at Morris Creek in Howe which is about 15 minutes south of Poteau. 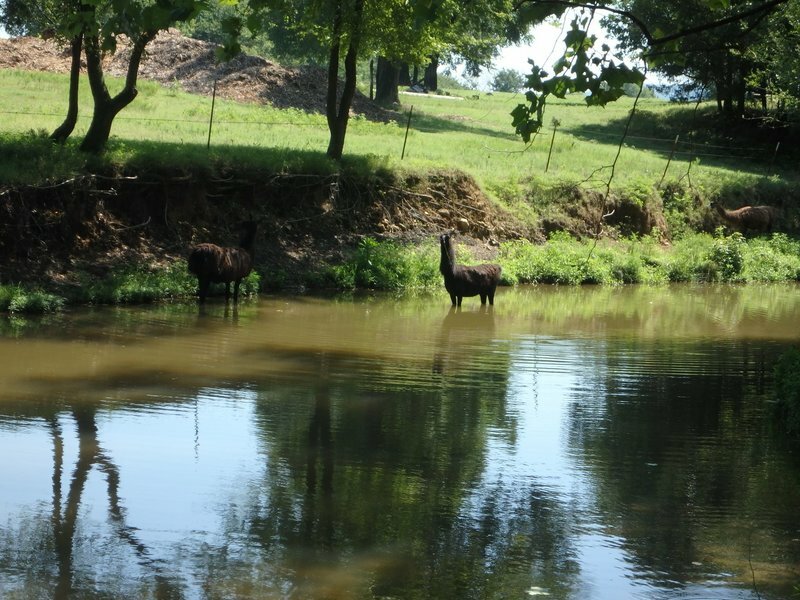 This is a VERY neat site, not just because of the llamas, but because of the numerous species of fish we caught. I'll have to wait to see when we get the official results back from the taxonomist, but I know we collected over 15 species of fish!" Mrs. Cooper and her Howe High School Science Club students will continue to monitor Morris Creek throughout the 2018-19 school year. Mrs. Cooper started the monitoring of Morris Creek in September of 2017. Oklahoma Blue Thumb volunteers on the Howe staff include Mrs. Tammy Parks, Mrs. Leigh Cooper, and Mr. James Marshall. 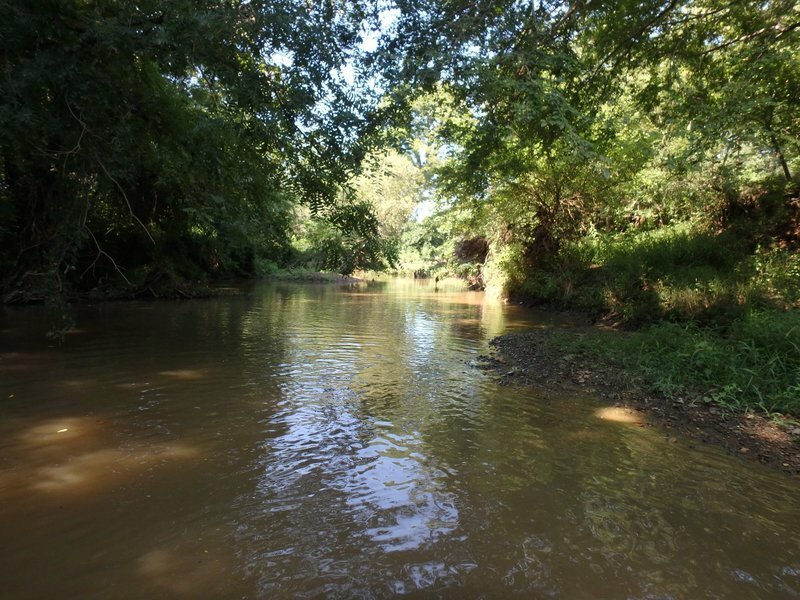 We would like to thank landowner, Jamie Gillham for allowing the students and staff at Howe Public Schools and the Oklahoma Blue Thumb staff to access Morris Creek from his property. This partnership allows for deeper learning in the field of science and provides an authentic, hands-on opportunity for the Howe students and staff to get outdoors and join together to meet the goal of Oklahoma Blue Thumb which is to "provide stream protection through education." For more information on Oklahoma Blue Thumb, visit their website at http://www.bluethumbok.com and like them on Facebook https://www.facebook.com/BlueThumbOK. The end of our 400 meter (~1/4 mile) creek assessment. The start of our 400 meter (~1/4 mile) creek assessment. 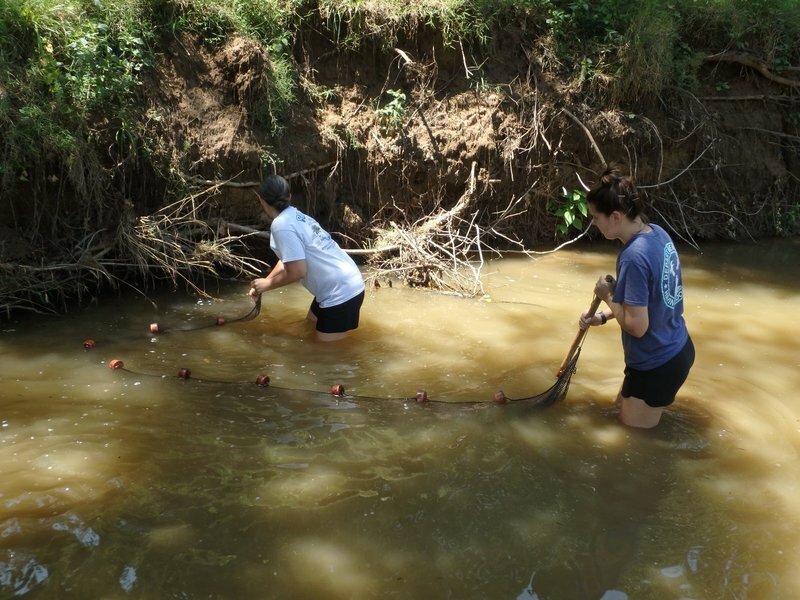 "Mrs. Cooper and Mrs. Wigginton seining. Well done Mrs. Cooper poking in the undercut banks to scare fish out and into the seine." 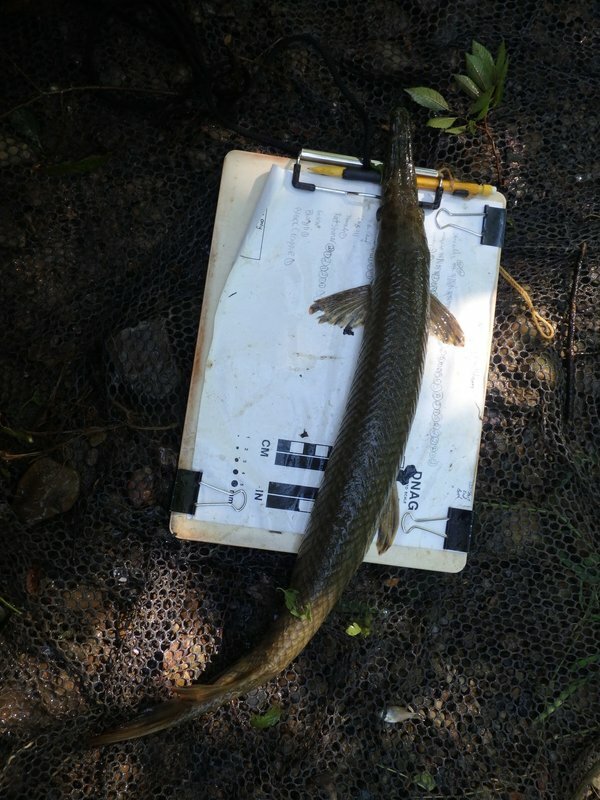 "This was our biggest catch of the day, a spotted gar!"